Happy Thai New Year, each year around April. Songkran is the Thai celebration of the passing year, and the festivities extend out for days. Traditionally, you will find most businesses are closed on the day of Songkran, but the streets are filled with smiling faces, water guns, and bright colors. That being said, leave your electronics in a safe place! It’s a great idea to put your phone, camera, wallet, etc. in a ziptop plastic bag! It will be a gorgeous celebration to photograph, but no one is exempt from water splashes and pours. No matter where you find yourself in Thailand during this time, you will find a party! The key to making your trip to Thailand for Songkran perfect is knowing the types of celebrations that you will find in the 3 most popular provinces. Check out each of the top 3 to find out where you’ll find the party scene fit for you! Thailand’s capital holds some of the most posh parties you will find in Thailand. If you crave a luxurious experience, this is the city for you during Songkran. You will be able to find many exclusive hotel parties with gorgeous views of the city below. The gay nightlife in Bangkok is legendary, so you will be busy from day to night! Multi-floor dance parties, great drinks, and divas can be found at DJ Station, while Babylon, famous for its gay amenities, will give you everything from pool parties to foam parties and everything in between! While you can’t go wrong in Bangkok when it comes to partying, Khao San Road and Silom Road are known for their festivities. Taking your journey down these routes will lead to some awesome adventures. During Songkran, do not plan on driving anywhere in Phuket, as the streets will be filled almost exclusively with people, water, and laughter. Being that you’re already surrounded by water on this island, you can bet this is one wild party scene! If you’re looking for an escape from the festivities, there are numerous beaches calling your name! A standout attraction for the gay community is Paradise Complex in Patong along the ocean, where you can find adventure in venues like Boat Bar with tons of shows and dancing. The beach scene of Phuket will give you plenty of space to soak in the warmth from the sun so that when the ice cold water comes flying, you’ll be ready! If you don’t find yourself on a beach (which is always a great option), you can head to Phuket Town or Bangla Road to see most of the action.You’ll find that traffic police will be major targets of water deluges, and that they take the festivities fairly lightly! Chiang Mai is known for its down to earth atmosphere, but during Songkran the energy is at an all time high. It is an amazing experience to see the laid back aura turn into an intense festival. You’ll be a target for water fights from the moment you walk out the door during Songkran, so you must be sure to wear clothes you don’t mind getting messed up! Inside the many gay clubs and bars of Chiang Mai, you will find one of a kind shows and parties. From Ram Bar’s Cabaret show to Club One Seven’s pool parties, you will be entertained all night long. While these venues are always places of attraction, Songkran ensures that everyone is in the best mood and having the time of their lives. Because April is one of the hottest months of the year, Chiang Mai is ideal during Songkran. While you’re splashed with endless water, you’ll be looking at the beautiful landscape of this province! This will be one of the best getaways that you can experience during Songkran, as you can always escape to the hillsides to perhaps find some quiet time to be with someone you love! 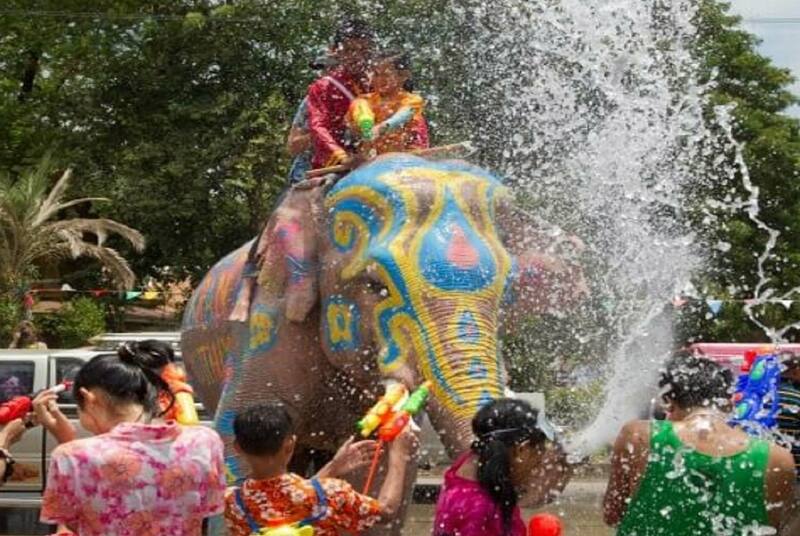 Songkran in Thailand is unlike any other experience. Being in Bangkok, Phuket, or Chiang Mai will elevate your energy to new heights. The excitement during this celebration time is infectious and will have you smiling from ear to ear. On that note, make sure you don’t swallow the water that’s thrown, shot, or poured on you, as you never know what it has been through! While there are a lot of precautions to take during Songkran, they’re all in the name of a great time! Each of the 3 most popular provinces have their own unique spin on the Songkran experience, where you will find the right party for every taste!